Scudder (Liam Neeson) is a bit of a Luddite – he hates computers and doesn’t have a cellphone. He doesn’t carry a gun – if he has to, though, he certainly knows how but prefers to talk his way out of trouble if he can. He’s also a recovering alcoholic who comes upon this case when Pete Kristo (Boyd Holbrook, Hatfields & McCoys), a slight acquaintance from an AA meeting approaches him on behalf of his brother, Pete (Dan Stevens, Downton Abbey), whose wife was kidnapped and, after paid her ransom, returned to him chopped up into little pieces – each carefully bagged up like the drugs he sells. At first, Scudder doesn’t want to take the case, but a second similar murder he uncovers in a library – where he makes the acquaintance of black street kid TJ (Brian Bradley, Earth to Echo) whose ability to use a computer gives him a bit more information and, in the film’s one semi-false note, tries to persuade Scudder to help him become a detective. Written and directed by Scott Frank, A Walk Among The Tombstones isn’t particularly gory until the finale, and the murders being committed – and the way they are depicted in the film – are never exploited to the depths of, say, Criminal Minds. There’s no basking in them, and the perpetrators – who seem to have some very slight connection to the DEA – are clearly insane. The fact that we never really learn why they’re doing what they’re doing is both refreshing and terrifying because they could be any two guys, anywhere. 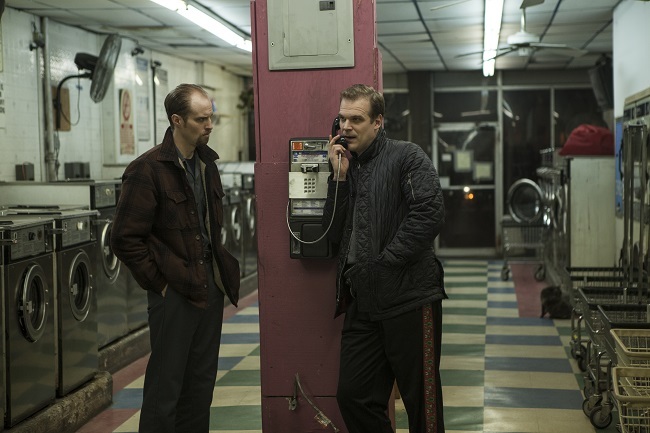 Ray (David Harbour, The Newsroom, Manhattan) and Albert (Adam David Thompson, +1) are both incredibly prepared and remarkably thorough in their reprehensible actions. They live together and, even in their one domestic scene, are creepily normal. How creepy are they? A one-time accomplice commits suicide rather than talk about them! When they attempt to blackmail Yuri, (Sebastian Roché, Odyssey 5, Supernatural) another drug dealer, by kidnapping his fourteen-year old daughter, Scudder steps in in a scene that reminds of the Taken series but which is taken directly from the novel. Frank has really captured the flavor of Block’s Matt Scudder novels and there are several shots of Neeson that look like they could be from the covers of the books. The film is paced a notch above deliberate and there are few action scenes – but when they come, they get messy. Scudder is a haunted man – he’s an ex-cop for a good reason (explained in a prologue set in 1991) and attending AA because that reason made drinking no fun. Neeson plays him subtly. The pain that sometimes flickers behind his eyes is palpable – as is the rage. When he takes over in the scene I mentioned above, he manages to creep out the creepy bad guys. 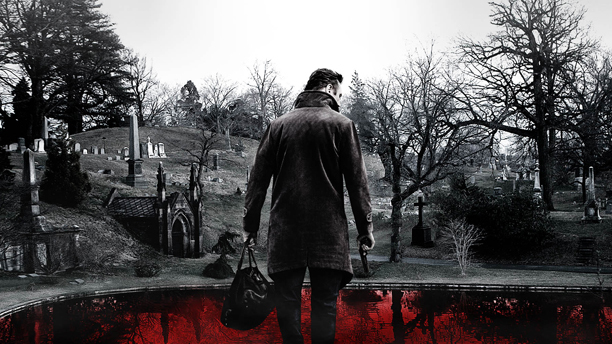 In fact, creepy is a good way to describe A Walk Among The Tombstones. It’s dark, moody, pulpy noir – and R-rated nasty in good ways. Scudder is a tarnished knight without a cause. The combination could lead to a sequel, and that would be a Good Thing. Previous PostThe Maze Runner – Everything Is Going To Change!Next PostInterstellar’s Three Gorgeous New Posters!